Thanks to Luke George who took this photo a couple of years ago at our cliff jumping spot. If all your friends jumped off a cliff, would you follow? One of my favourite summer activities is cliff jumping. There’s a spot about 2 hours away, where the deep ocean meets the cliffs to form chiseled inlets. There are various heights from which you can jump. Three meters; seven; fifteen. I once saw someone jump from about twenty meters and was afraid I’d see their body splat onto the rocks below. I say I love cliff jumping, but to be honest, everything in me hates taking the leap. As I stand on the edge, every nerve ending tingles, frantically bombarding my brain with the instinctive message that jumping is a bad idea. I hate the moment when I almost jump but don’t, and then, even more, when I launch myself out and have that split second realization that it’s too late to go back. I hate the feeling of falling; legs kicking at the air; arms tensing in an attempt to defy gravity. I hate the way the water hurts if you hit it on a bad angle, like a mammoth slap. In fact, there is only one thing I really like about cliff jumping. It’s when the water catches you and holds you momentarily in its belly, and you rise and break the surface and feel ecstatic triumph. When you know, with a sense of pride, that all your friends jumped off a cliff, and you were brave enough to follow. 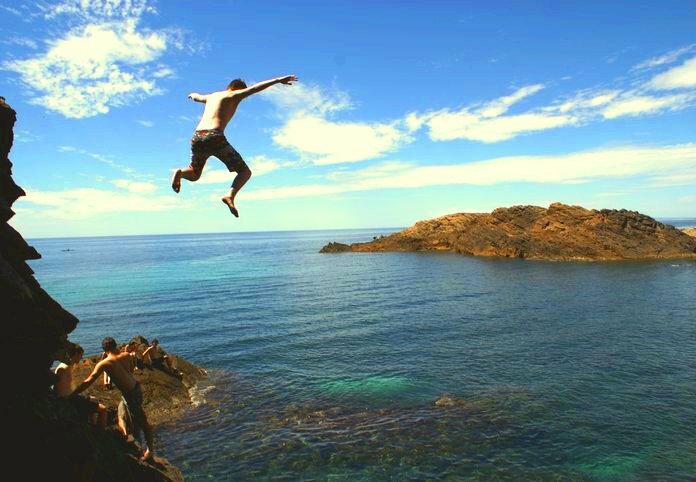 This entry was posted in Things I Love and tagged adventure, Australia, BASE jumping, beach, best spots in SA, cliff jumping, cliffs, extreme sport, fun, Jumping platform, ocean, Recreation, South Australia, summer. Just when I thought I knew you, you tell me your a cliff jumper. I never would of guessed. I look forward to further surprising you in the future! I have only jumped once from a 50 ft jumping tower. Zip lines into the water no problem. Jumping tower-never again. That was when I was young and would try anything. I hit the water with my feet together, but the water pulled my right leg behind me as if I were a ballerina in a fully extended tip toe balancing pose. Let’s just say that was the first time when age and sense put a stop to such feats. My hip hurt for days. 🙂 Nice to find out you’re a fellow daredevil! I can imagine the pain! But was the pain worth it to be able to say that you did it?